A few weeks back I made some purchases on the site because they had some great deals!I asked my fiance's sister and she said her stuffs arrived within 2 weeks.That happened to me too.Very efficient as the website is based in the UK.So far I've made three purchases from them.Two a few weeks ago and one just a few days back(haven't arrived). I bought 5 items from them for my first two purchases.They arrived on the same day.This is because when I made the second order..it was a few hours after the first.hahaha. 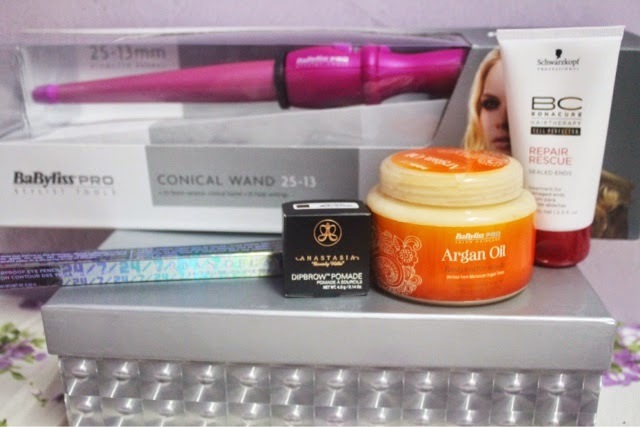 What I bought was a Babyliss Pro Conical Wand in pink,Schwarzkopf Bonacure Repair Rescue,Babyliss Pro Argan Oil hair mask,Anastasia Beverly Hills Dipbrow Pomade in Dark Brown and Urban Decay 24/7 Glide-On Eye Pencil in Roach. The prices are as follows(in gbp). Clearly the prices was sooo affordable.Plus they give free shipping if you spend USD 16/GBP 10.All of the items that I purchased arrived within two weeks. I loved all of the stuffs that I bought.The conical wand was something that I've wanted for quite sometime.Previously I had a haircurler with the clamp and I think it's a hassle.This one gave me much more control.The wand had a lot of heat settings,it came with 2 finger gloves and also a pad for you to put the wand on in between curling your hair.I haven't had the time to experiment much using it.But I'll definitely put it to good use soon. I'm crazy about hair masks.Good ones.Because my hair is so long and I tend to colour it every 2 months or so(I get such an itch to colour it),I always make sure that I take great care of it.I use a hair mask everytime after I've shampooed my hair( I wash my hait every 2 days).I don't use the normal conditioner.I love the Babyliss Argan Oil hair mask.It was really moisturising for my hair and made it soft and shiny. The Bonacure Repair Rescue is amazingggg.It's a leave in treatment for the ends of your hair.You don't need to rinse your hair after you put it on.I can feel such a difference on my ends whenever I put it on.It makes my hair so soft! 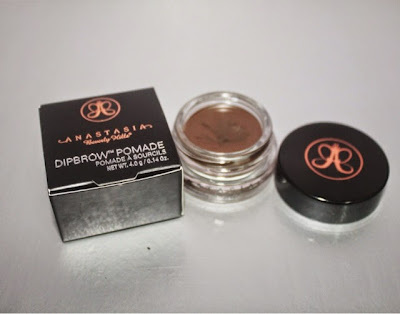 The two beauty products that I use everyday is the Anastasia Dipbrow Pomade and Urban Decay's 24/7 eyeliner.I love both products so much!The dipbrow makes it so much easier for me to thicken my lashes while making it looked natural.There's nothing worse than a visible eyebrow liner line on your eyebrow(that's a mouthful!) or having eyebrow colour that doesn't match your hair. The pomade does dry out though so make sure that you keep the lid tight after you used it.I use my Zoeva brow line brush or their eyeliner brush to apply the pomade. 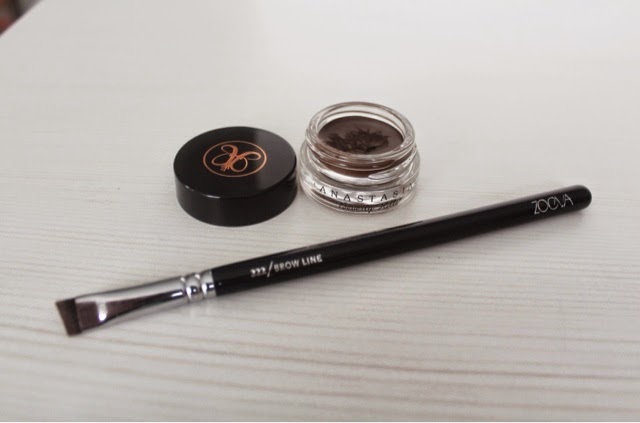 The Urban Decay eyeliner was recommended so much by Tanya Burr in her beauty videos..and she mentioned how she use Roach all the time.Coincidentally Beautybay had an awesome discount on it so I of course had to grab it.I love this eyeliner.It glides smoothly,it looks pretty and it lasts a longgg time until you use a makeup remover to get rid of it.It doesn't budge or smudge. The eyeliner is basically a dark bronze colour.Very pretty and can be worn by every one.I use this everyday to line my bottom lash line/waterline. I will blog about my next Beautybay once the items arrived. :) I would definitely recommend you girls out there to purchase stuffs from them as they're based in UK and as you know..most UK beauty websites like Feelunique and Superdrug doesn't deliver here.So this is a great alternative to them. How is the Babyliss Pro Conical Wand ? Is it any good? sorry for the late reply!Yup it's good..there's so many heat settings for different hair thickness.